Saturday was a lazy day around these parts. In the morning we set out to the art festival and after sucking up a bit of Florida sunshine we returned home to do what I love doing best. Partaking in a lazy Saturday. Yep, I sat on the couch and relished on the fact that I did not have to did not want to do anything at all. That apple pie I promised Tom? Nah, it could wait. That cornmeal cake bookmarked? Nah, it could wait. The lobster pot pie I told myself I would make? Changed it to this quick recipe instead. Inspiration was taken from one of our Gutsy Cook menu choices for the week and I used what I had in the refrigerator at the time. This comes together super-fast and I paired it with a quick salad of mixed greens. Then we sat in front of our TV and continued our day of leisure. Because, what could be better than spending a lazy Saturday day with your sweetheart? 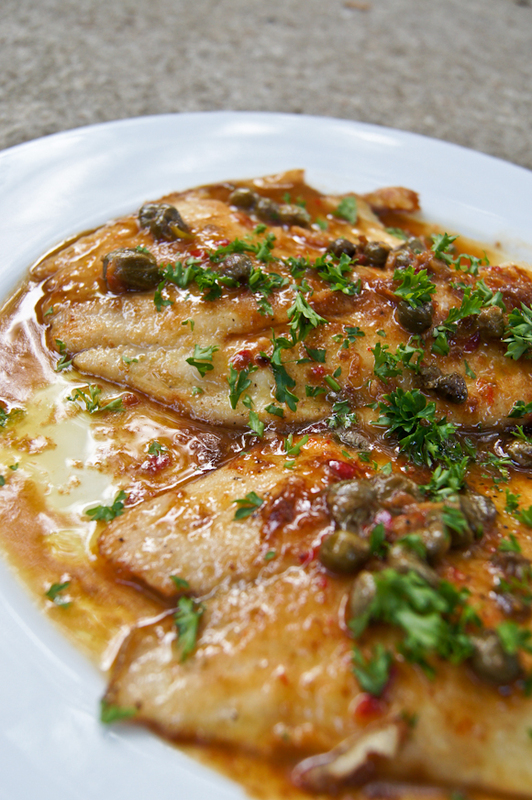 The sauce has the perfect blend of saltiness and tangy taste, which is perfect for the mild-bland tilapia. Don’t let the list of ingredients scare you either. The best part of this dish is that you can omit anything (if you don’t like capers or anchovies, you can leave them out) and still get a delicious dish. You can also play and add cream, sour cream or yogurt - whatever you have on hand to make it a perfect pairing to some pasta or rice. I have learned that when it comes to fish, simple is best. Pat the fillets dry with paper towels. This step is very important in order to sauté the fillets properly. Sprinkle with the pepper and salt and use the flour to coat each filet lightly with it. TIP: Dredging must be done at the last minute to assure a crisp coating. In a large skillet, melt about 3 tablespoons of the butter with the oil over medium heat. When the butter foam has subsided, slip the fillets into the skillet. Sauté over medium to medium-high heat until lightly golden, about 1 minute on each side depending on the thickness of the fillets, turning them only once. Transfer to a heated platter and reduce the heat to medium-low. Add the capers, garlic, chili and anchovy paste and wine. Stir to scrape up any browned bits from the bottom of the pan. Cook until the alcohol has evaporated, about 2 minutes. Add the lemon juice and about 1 tablespoon of butter to create a smooth sauce. Stir in the parsley and taste. Season with salt and pepper if needed. Remove the pan from the heat and pour the sauce over the fish. Serve immediately. Make sure you check out what the other Gutsy Cooks chose to do on their own Saturday here.